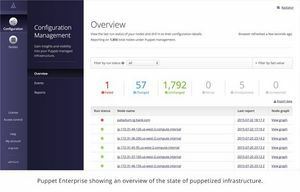 PORTLAND, OR--(Marketwired - Jul 28, 2015) - Puppet Labs, the leading provider of IT automation software, today announced the next major update to its flagship product: Puppet Enterprise 2015.2. This release includes new features providing DevOps teams with clarity, simplicity and additional management capabilities, including an all-new user interface, an interactive graph for visualizing infrastructure code, a new unified agent and broader infrastructure support. For the first time, IT teams have a visual representation of the models defined by their code, making it easier to respond to changes quickly. "One of the fundamental tenets of DevOps is to manage your infrastructure as code. It makes practices like unit testing, peer review, version control and continuous delivery possible," said Nigel Kersten, CIO of Puppet Labs. "I'm thrilled that, for the first time, users can now visualize their code -- actually see the models they build. This kind of visualization and insight will become more important for teams as they manage an increasingly complex set of technologies and infrastructure." Puppet Enterprise is rapidly becoming the lingua franca of the data center. More and more organizations rely on Puppet Enterprise, extending it across diverse teams and scaling it to their rapidly expanding infrastructure to manage compute, storage and networking from a single platform. 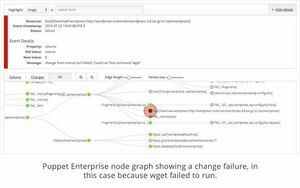 Puppet Enterprise 2015.2 offers a new user interface for managing large, complex infrastructures, including the first interactive graph for visualizing infrastructure code. 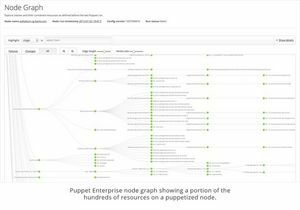 In an industry first, Puppet Enterprise 2015.2 includes a dynamic, interactive graph that visualizes infrastructure models that admins have defined with their Puppet code. Now that teams can visualize the models they've built, it's easier to optimize their code and respond to changes faster, ultimately reducing the time it takes to return infrastructure to the correct, desired state when it diverges. DevOps-driven organizations have multiple code contributors from different teams across IT. This makes collaboration key to creating agile, maintainable and robust code. Visualizing the models defined by infrastructure code helps multiple teams identify where the models can be improved to minimize failures, improve change response time and further enable collaboration around infrastructure. The 2015 State of DevOps Report, Puppet Labs annual report and survey polling more than 5,000 IT professionals, points out that a key component of success is the ability to provide entire teams with visualizations that show entire teams the state of work in progress and the quality of that work. It's now easy to filter and search thousands of puppetized nodes and quickly locate infrastructure with specific characteristics. This is especially powerful for organizations that use Puppet Enterprise to track operating system updates, server migrations, warranty expirations and other factors that change across their infrastructure. For example, if you want to migrate from Windows Server 2003 to Windows Server 2012, the new node filtering makes it simple to track the burndown of 2003 and uptake of 2012 across your data center. The 2015.2 release unifies the open source and commercial agent technologies on the same codebase. The result is a simpler, easier upgrade path for the thousands of organizations around the world currently using Open Source Puppet that want to take advantage of additional innovation. Further improvements to core agent technologies make the Puppet agent lighter and faster. For example, one of the core agent components is now at least 20 times faster, and has a 50 percent smaller memory footprint. Puppet's simple programming language is the most widely used means of describing and managing infrastructure. The newest release of Puppet Enterprise includes major enhancements to the Puppet language that make it easier to write and maintain even more powerful Puppet code. Enhancements include iteration, parameter type checking and better error handling, in addition to changes that improve the usability, completeness and consistency of the language itself. Last year, Puppet Labs introduced Puppet Supported modules, assuring customers of professional support for managing their most commonly used and critical infrastructure, such as Amazon Web Services, Docker, Microsoft SQL Server, Tomcat, and more. As part of the 2015.2 release, Puppet Labs is announcing availability of a couple new Puppet Supported modules. Citrix NetScaler. A new Puppet Supported module (https://forge.puppetlabs.com/puppetlabs/netscaler) eliminates errors with load balancing and content switching, by enabling application delivery controller devices to match the same defined configurations as computing infrastructure. VMware vSphere. A new Puppet Supported module (https://forge.puppetlabs.com/puppetlabs/vsphere) accelerates provisioning of virtual machines, and allows IT teams to launch and configure virtual machines and manage CPU, memory and machine configuration over time. Puppet Labs, Inc. is the leader in IT automation. Puppet Labs software provides system administrators the operational agility, efficiency and insight they need to proactively manage dynamic infrastructure, scaling from tens of servers to thousands, both on premise and in the cloud. Thousands of the world's leading organizations use Puppet Labs software to configure and manage their IT infrastructure, including Bank of America, Cisco, NYSE, Salesforce.com and WebEx. Based in Portland, Oregon, Puppet Labs employs more than 360 people. The company is backed by investors Kleiner Perkins Caufield & Byers, Google Ventures, VMware, Cisco, True Ventures, Radar Partners, and Triangle Peak Partners. To learn more, please visit PuppetLabs.com.